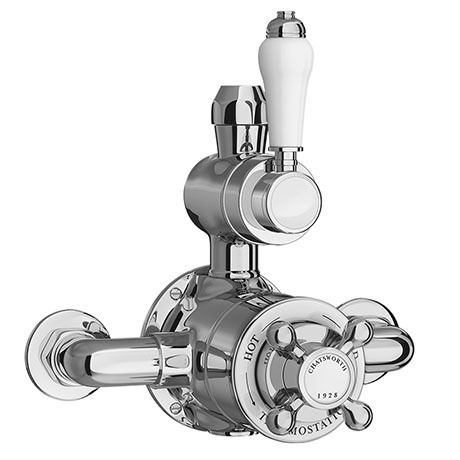 The Chatsworth 1928 traditional twin exposed thermostatic shower valve with stylish ceramic control dial offers thermostatic showering via two easy to operate controls, one operates flow control whilst the other allows temperature selection. To be used with rigid riser kit, the classic style of this exposed shower valve adds a touch of sophistication and elegance in any bathroom. Manufactured using high quality chrome and brass, our range of traditional shower valves will look outstanding in any shower enclosure.